I’m attempting to add comments to the blog. Unfortunately, I have to use DISQUS to do this. I’m having some problems, but it should be resolved shortly. After our discussion about student abilities yesterday and reading the chapter on fear in Courage to Teach, a friend of mine posted this picture to my facebook wall. It reminds me that when we use normative discourses to define our students’ abilities, we lose the ability to see the skills and knowledges that they do offer. 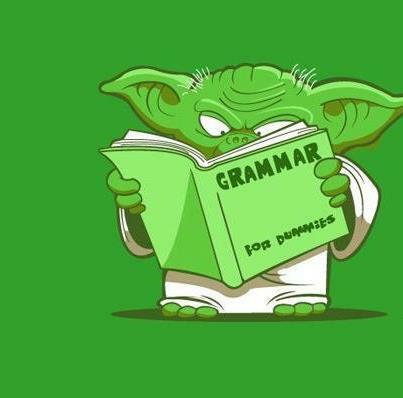 In the image, Yoda is reading Grammar for Dummies. Skilled in the way of the Force, Yoda is clearly not inept nor a “dummy.” He does, however, have a speech pattern that is unconventional. Were we to focus on his “incorrect” speech pattern, we might assume his stupidity and would miss out on all he might teach us. I think the same is true of our students. When all we notice are the differences that distinguish them from ourselves, we can miss out on what they have to offer and what they bring with them to the learning experience. Today we discussed Echo360 as a tool for recording lectures. It’s an interesting tool that might be useful for distance learning or blended classes. One professor saw potential application to her public speaking course. I think it’s a terrific idea for students to be able to review successful speeches as well as speeches that could be improved, but I’m wondering about privacy issues raised by recording and posting students even to the “private” space of Blackboard. For example, what if a student thinks it’s funny that Suzie’s speech went horribly wrong and she started crying in the middle of class? He posts the video to YouTube and Suzie’s embarassment in front of 20 students becomes an embarassment in the face of ½ million viewers. On the one hand, Blackboard functions as an extension of the classroom space, and, as such, is not open to the public. All the users who have access to the space have equal access to the classroom to be able to see live performances of these speeches. On the other hand, these are still digital files that are being created and posted to a space. Even if the files cannot be downloaded and stored by student users, screen capturing software could still be used to record and disseminate the files. I bring this up to note that despite attempts to retain control of files created, it cannot be guaranteed. Is the vague threat that a malicious student might misuse educational materials to harass another student reason enough to deny ethical students the help they might get from reviewing their speeches? I don’t think so. But, cyberbullying is a concern for millenial students in middle and high schools and hazing is certainly a concern for highed ed students. As such, I think it’s worth considering the potential misuses alongside the potential uses of technology in the classroom. I joined the QEP workshop because I’ve had a blast incorporating technology in the classroom in the past. Second Life was a fantastic tool for making asbstract concepts, like the social construction of race and gender, concrete for the students. Unfortunately, I became a little burnt out on tech in the classroom after teaching exclusively online for a year. Universities tend to feel that we can simply translate face-to-face materials into online spaces and give instructors the same, or perhaps a higher, teaching load without any difficulty. This may be the case for pre-packaged online classes, but for teachers who seek to be innovative in these spaces, the lecture for one class can take hours more than it would in a traditional face-to-face class. I found this a frustrating experience that turned me off of technology for a little while. A year after finishing that experience, I find my curiosity and my commitment to expanding students’ technological skillsets re-emerging. At this point, I have one major project in mind–the collection of ethnographies to begin a database. I’d like to include more technology in the class, but I don’t want to include technology to simply include it. I’ll spend the next few weeks really thinking about how this technology we’ll be learning about can help me achieve the student learning outcomes I’ve laid out in the syllabus.